Streembit is a decentralized, peer to peer (P2P) real time communication system for humans and machines. The application aims to implement a system that securely manages humans to machine and machine to machine (M2M) communication without using a central server or client-server infrastructure. The actors of the system are nodes on a peer-to-peer network. Hardware services are manifested in smart contracts that are accessible via messages and transactions. The system uses a Kademlia distributed hash table (DHT) discover human and machine nodes on the network. The system ensures data integrity using public-private key cryptography. Messages are signed with the contact’s private key on the client side using ECDSA cryptography. The data is encrypted using ECDH key exchange to exchange the cryptography keys between the contacts and AES symmetric encryption. The video and audio chat feature utilizes the WebRTC the protocol that allows a fully encrypted video and audio communication in a true P2P manner, without routing the conversation through of any central servers. The system is free, fully open source and released under the GNU General Public license. The source code is available at https://github.com/streembit. Users can download the source and build the application from directly the source code. We encourage peer review by security experts and software developers to verify there are no security backdoors exist in the system and the application complies with security and communication standards (FIPS, JWT, JWS, JWE, etc). The Streembit system forms a decentralized peer to peer network to manage connections between machines and machines or humans and machines. The participants in the network are the peer nodes. The peer to peer network is scalable and an unlimited number of nodes can participate in the network. The system performs public private key infrastructure based authentication and access control functions to securely connect peer nodes. The application generates at least one private/public key pair on each peer node including on the Internet-of-Things devices. The actors of the system publish their public keys to the peer to peer network via a Kademlia distributed hash table (DHT). Each peer node knows the public key of the other connected peer nodes. The system identifies peer nodes in the peer to peer network by their public key. To ensure data integrity the nodes sign the messages with their private key. The nodes sign all messages - there are no unsigned messages circulated in the system. (The requirement for signing the messages also help to mitigate the risks of Sybil attacks and DDoS attacks). Public network. Anyone can connect, there is no security gate enabled in the public network. The main Streembit network is public. Private network, which implements a security gate to block communication from the public Streembit network. Only certain peer nodes are allowed to connect to the network. The access control is governed by built in authentication functions. Typically, one to one peer connections, teams, communities or businesses would run private Streembit networks to isolate their communication from the public network, to implement and extra layer of security and establish an even more secure communication system than the public Streembit network. The cornerstone of Streembit security is elliptic curve public/private key cryptography infrastructure (PPKI). PPKI allows the implementation of robust security. We use PPKI to identify the entities of the system (based on their public key and PPKI signature), perform authentication, and ensure data integrity (using cryptography signatures). Using the public/private key cryptography infrastructure paves the way for the deployment of a robust, secure authentication and access control scheme. The parties are identified by their public key. The authenticity of messages and the identities of the actors are then verified using PPKI cryptography routines. Using a PPKI infrastructure based security scheme greatly simplifies the authentication, access control, and identity management aspects of Internet-of-Things security. The ultimate issue of all applications, systems, and devices that protect data with cryptography is the security of the symmetric key of the encryption or the private key of the public/private key pair. Similarly to the iPhone and PGP, which both use passcode to protect their keys, Streembit requires users have a passcode to protect their PPKI private key. The Streembit passcode that protects the user’s PPK key pair is relatively complex. Both 128-bit and 256-bit AES symmetric encryption, the cryptography schemes of the messages in the Streembit network, are safe from any brute force attacks. 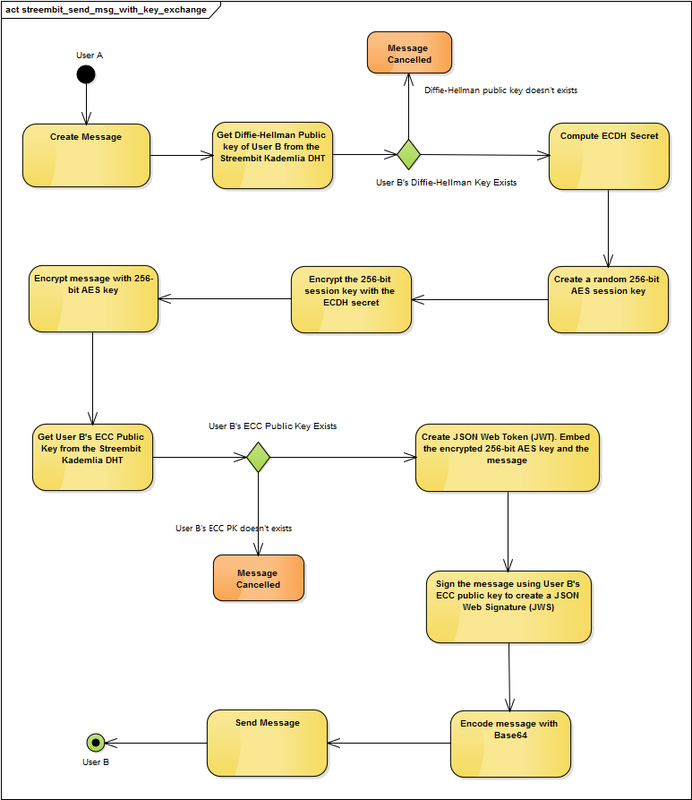 The following UML diagram describes the key exchange using ECDH and securing the message with 256-bit AES symmetric key between "User A" and "User B". 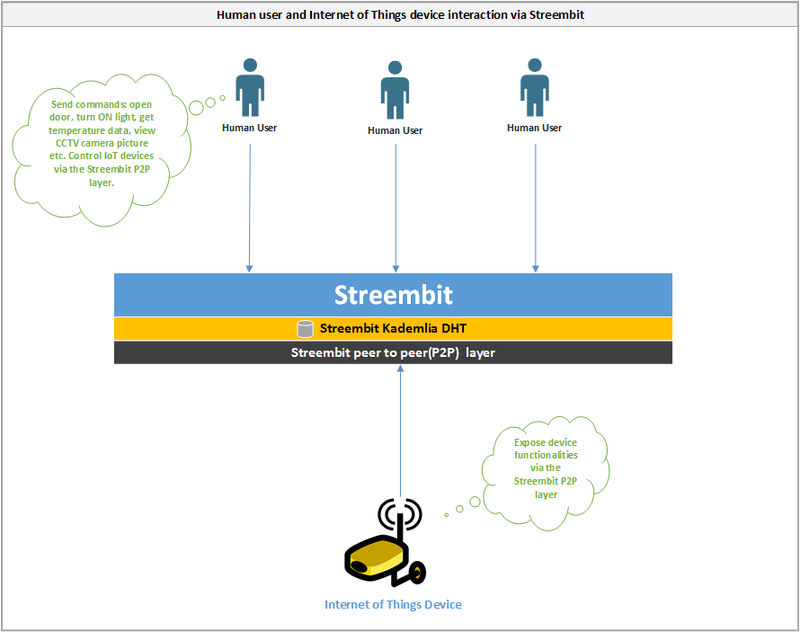 Streembit is a unified communication platform for both human users and Internet of Things devices. 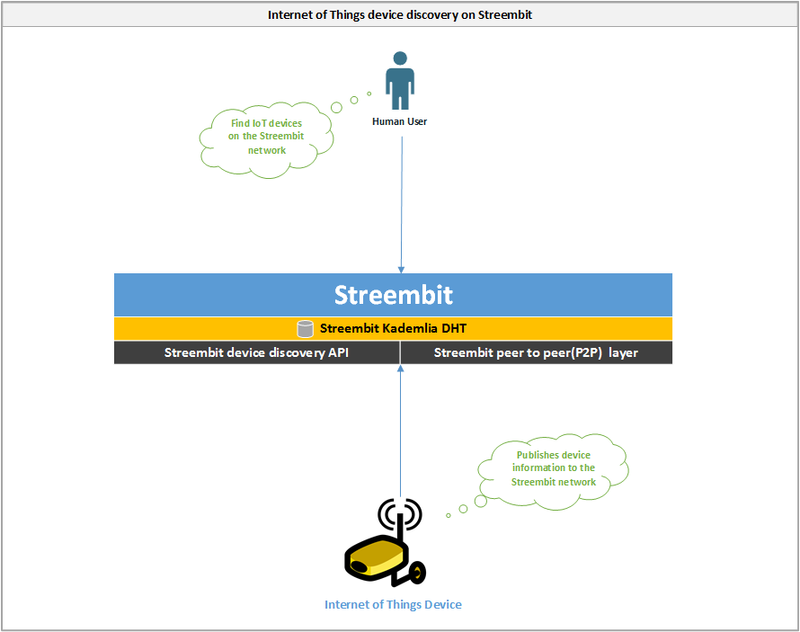 Streembit manages device discovery as well as authentication, access control and provisioning of devices without using a centralized authority server. The system facilitates device discovery and device control in a peer to peer manner. For many IoT use cases a decentralized, P2P network topology is the most secure, robust, scalable and reliable method of operation. Instead of using expensive corporate owned third party cloud systems, Streembit manages Internet of Things devices without the need of proprietary centralized cloud platforms. Centralized, corporate owned cloud is certainly an easier way to build out IoT platforms. However, the owners and authorities in these topologies all have an influence upon the network and can be exploited. They can ban devices, spy on devices and compromise data integrity of devices. In fact, government can order them to do any or all of these. In the near future, the doors of your garage and home, air conditioning units and your home security system will be fully internet connected. You will be able to control your home automation system from your mobile phone. It is essential that only you can control your IoT devices. Streembit excludes third party service and cloud providers from the ecosystem to give full control to the end users over the devices. The primary premise of this system is that all aspects of the IoT device operation must consist of decentralized P2P communication between the device and human user. For example, in the case of a building’s door device: a secure and decentralized P2P system can manage the door (including device configuration, upgrades and provisioning). There is no need to involve a centralized server nor a cloud based solution in order to implement a secure and fully operation Internet of Things system. Streembit allows IoT application providers and context producers to register their IoT Objects on the decentralised Streembit network, and in turn allow context consumers to discover them in a secure and peer to peer manner. The data is end to end encrypted between the human user and IoT device. The encryption key is shared only between the user and device – never with any third parties. The user interacts with the device via the Streembit P2P layer and UI. For example, opening a door, turning ON a light, controlling motor speed, getting temperature data, viewing CCTV pictures etc. all peer to peer, without a centralised solution and via the Streembit user interface. Hardware and software providers upgrade Internet of Things devices on the always up and running Streembit network. 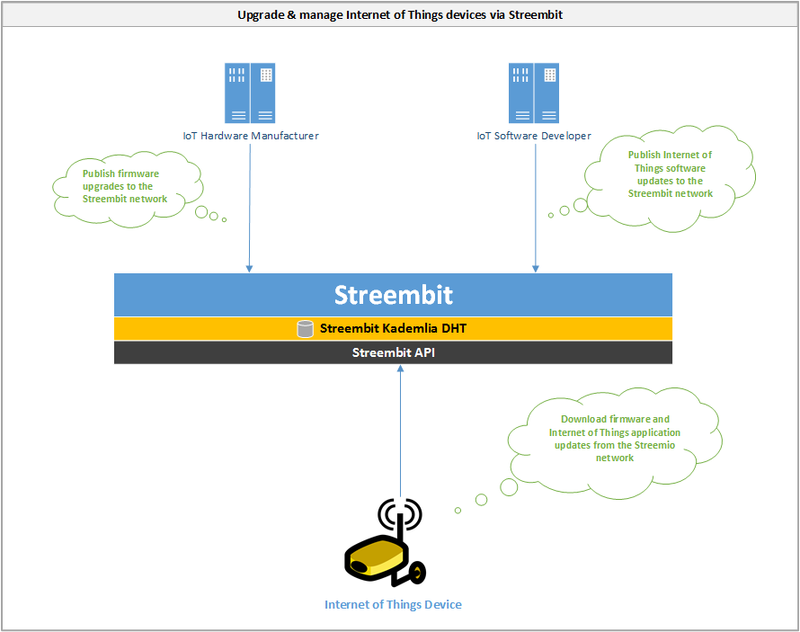 Internet of Things device manufacturers and software designers publishes firmware and software updates via the Streembit network. Internet of Things devices run the Streembit system and ensure the origin and data integrity of the updates by verifying the public key of the publisher. The Streembit Internet of Things system is based on the latest W3C Web of Things standards. The system incorporates the latest modules from the W3C web-of-things-framework. The devices are defined with JSON-LD and the security uses FIPS standards for cryptography and JWT, JWS and JWE standards to secure data. To integrate devices with Streembit please refer to the IoT section of the Streembit Github repository. Click on the Tools/Settings menu item to open the Settings screen. TCP port: Use this TCP port to communicate on the Streembit network. Port forwarding or the UPNP settings of your router must grant access to this port in order to send and receive data. If the transport is WebSocket (WS) then this settings is not used by the application. WebSocket port: If the TCP port is not available then the connect to the WebSocket listener must listen on this port. Transport: Transport protocol. The default is TCP. Select the WebSocket transport if the incoming TCP traffic is blocked by your router or firewall. If the WebSocket transport then make sure the WebSocket listener seed node is operational. Use WebSocket fallback: Many firewalls and home network routers block incoming TCP communication and this is a fallback solution for users who are unable to use the TCP protocol. By enabling this configuration option the system will try to communicate on the WebSocket protocol when the generic TCP communication is blocked. Please note, WebSocket listeners run by community peers and the availability of WebSocket listeners is limited on the network. Try to run your own seed to support the network and Streembit community, and ensure the WebSocket listeners is available! Also, make sure the WebSocket listener is enabled in the seed nodes if you run a private Streembit network! List of seed nodes: The seed nodes assist in user and device discovery, and stores the users’ public key data in their distributed hash table (DHT) storage. Also, you can define here your seed nodes if you run a private Streembit network. Complete decentralization is not possible in Internet communication. All decentralized systems like Bitcoin or Telehash must use some internet services for certain tasks. For instance, decentralized systems use DNS servers and services to resolve domain names. WebRTC video and audio chats clients use ICE servers to get information about their own IP address. Seed account, Seed port, Seed IP/domain name: If the Seed account, Seed port and IP/domain name are defined then the software operates in private network mode. Please note, the seed node must be configured to run as a private network node as well. Remove these configuration settings if you want to connect to the public Streembit network. Log level: Defines the log level. Debug: most detailed logging. Info: only important system events logged. Error: only application errors logged. Developer mode: Software developers should select this option to resolve directories and develop the software from IDE such as Visual Studio. If you want to use the Streembit network from your desktop computer, tablet or mobile device and communicate with other peers without using a central server you must allow inbound connections. Home connections are usually filtered by a router or modem. Streembit will request your router automatically configure itself to allow inbound connections to port 8905. Unfortunately, many routers don’t allow automatic configuration, so you must manually configure your router. You may also need to configure your firewall to allow inbound connections to port 8905. Please see the following subsections for details. If the Streembit application can’t automatically configure your router to open port 8905, you will need to manually configure your router. We’ve tried to make the following instructions generic enough to cover most router models; if you need specific help with your router, please ask for help on a tech support site such as SuperUser. Forwarding inbound connections from the Internet through your router to your computer where Streembit can process them. Please refer to your router configuration document for port forwarding information. 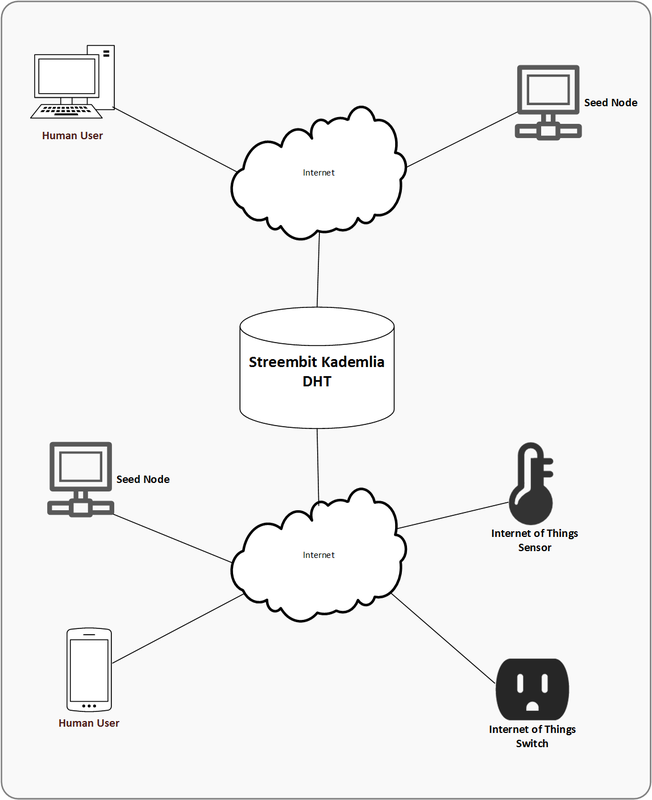 Human users and Internet of Things devices are identified by their account name on the Streembit network. Click on the Streembit/New account menu item or click on the New Account button from the start screen. Enter the password key pair encryption password. Based on the password, the system generates a 256-bit AES key using PBKDF2 with a randomly generated 160-bit salt. The system protects the ECC public key pair with the 256-bit AES key. The password must be at least 8 characters, must not contain empty space, must contain at least one letter, one digit and one special character. You can perform an account backup to save a local copy of your Streembit account data. The Streembit account can be restored from a backup using the “Restore account” function. In order to backup the account the account must be intialized. Click on the Streembit/Backup account menu item to start backup your account. Your account backup data is never saved on a central server by the Streembit application and the account backup file is saved to your Download directory. What is saved in the Backup file? Use this option when you need to backup your account but do not have an internet connection. Once you enter your password you will be able to create a backup file. Why restore your account data? Your contacts identify your account and validate your identity using your PPK public key. The public/private key pair is created using a random entropy - once it is created then it cannot be changed. The public/private key pair isn’t deterministic and in order to communicate with your contacts, you must use the same public key which was published to the Streembit network and known to your contacts. The published public key can be restored from an account backup file. You can restore your Streembit account data on any computer from a backup file. Click on the Streembit/Restore account menu item or the Restore account to start restoring the account from a backup file. It is a good practice to delete your account from the Streembit network if you don’t use it anymore. Click on the Streembit/Delete account menu item to remove the account from the Streembit network. Your Streembit system provides vital information using an application log file. The log file is JSON file format, and sits in the application /log directory. You can also open the log file by clicking on the Tools/View logs menu item. Configure the log to “Debug” log level to populate detailed debug messages from the application. Click on the “CONNECT TO PUBLIC STREEMBIT” button from the start screen or click on the Streembit/Connect to public network menu item to connect the public Streembit network. The user information view will be initialized. Enter your password and then the application will try to connect to the public Streembit network. Click on the “CONNECT TO PRIVATE STREEMBIT” button from the start screen or click on the Streembit/Connect to private network menu item to connect the a private Streembit hub. The user information view will be initialized. Enter your password and then the application will try to connect to the private Streembit hub. To get your public key either create a new account or initialize an existing account. Click on the Streembit/New account menu item to create a new account or click on the Streembit/Initialize existing account to use an existing account. Once your account is initialized click on the Tools/Account security info menu item. Your account name and public key will be displayed on the screen. Add this account name and public key data to the configuration file of private Streembit hub seed.